LEDs create light through voltage-induced recombination processes in a semiconductor layer. Compared to traditional incandescent lamps, the main advantages of LEDs are long useful life (up to 100,000 hours), low energy consumption and reduced depth of the modules. The colour of the emitted light is determined by the internal structure of the LEDs, and the use of red and amber for rear lighting functions has become standard practice by now. Not only do LEDs offer innovative and fascinating styling possibilities but, thanks to their fast switch-on times, they also provide added safety to vehicles, for examples in situations requiring instant braking. LEDs also require electronic control units (ECU) for the power supply, to ensure an interface with the electrical system of the different vehicles and, at times, to allow specific diagnostic functions. The first applications of LED technology date back to the early 1990s with the development of centre high mount stop lamps (CHMSL) with LEDs in a 5-mm package for the Japanese market. Today, all lighting functions can be equipped with LEDs: tail lights, fog lamps, brake lights and reverse lights. 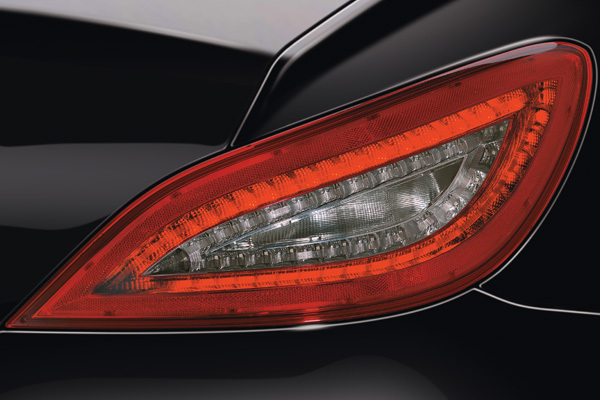 In 2005, Automotive Lighting launched a LED rear lamp for the sidelights, stop lights and blinkers. Additional projects concern the Lincoln MKX, Audi R8 and BMW X5.